Way back in 2011 I wrote a report about the Welsh engineering company Cintec which had won a contract to repair the Step Pyramid of Saqqara using their innovative WaterWall to hold up the collapsing roof of the tomb chamber while it was pinned in place. Difficulties on and off the job mean that the task has only just been completed. The on-the-job difficulties could be illustrated by the fact that it took Cintec and its local workforce a year and a half just to remove all the stones which had been dislodged from the ceiling of the tomb chamber by the earthquake. Each stone had to be carried by hand through the narrow passageways beneath the pyramid and then up the sloping ramp to the outside, where it saw light for the first time in nearly 4,000 years. As soon as the ground was cleared in one spot WaterWall bags were installed to support the ceiling and make the area just that little bit safer. Scaffolding and Cintec WaterWall bags provide the working environment for the engineers repairing the Step Pyramid. Off-the-job difficulties were rather less easy to handle. There were three changes of regime in Egypt during the period, each change preceded by a period of anarchy when the safety of Europeans could not be guaranteed and the poorly-paid Egyptian guards either turned a blind eye to the theft of anything moveable or were themselves the thieves! 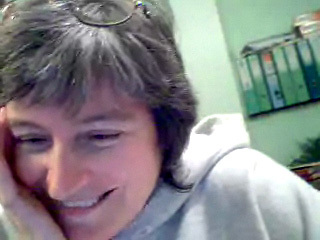 Computers that controlled the WaterWall system or which held vital paperwork were stolen (or vandalised when they could not be stolen), unauthorised persons roamed through the underground tunnels looking for "antikas" they could steal and clumsily tripping over vital power cables or support ropes. 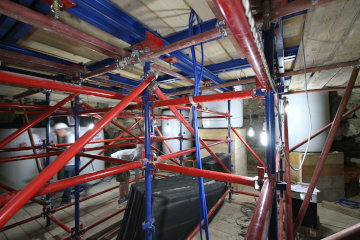 Once the fallen stones had been removed and the WaterWall bags were in position the next task was to erect scaffolding from which the Cintec experts could work, because the ceiling was at the top of the burial shaft which itself was 92' deep. Owing to the collapse of the ceiling, in some places the scaffolding had to be 150' or more high! Then the engineers had to assess each stone in the ceiling and decide which were the ones to be treated. 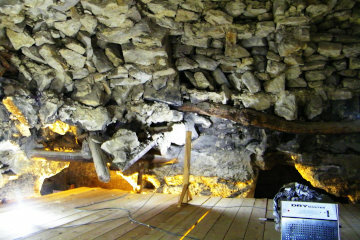 Decayed and distorted beams allowed the ceiling to collapse, as shown at bottom left. One of Cintec's discoveries - which I have not seen reported anywhere else - was that the ceiling of the burial shaft was not formed by corbelling, as happened with later pyramids. Instead the top of the shaft was covered with wooden beams and stones were laid over the beams. Over time these beams have both decayed and deformed, so that they no longer support the stones and it was merely the fact that the stones jammed together that stopped the whole lot collapsing down the tomb shaft. Although Cintec took steps to preserve the beams where possible, no attempt was made to straighten them or restore their function. 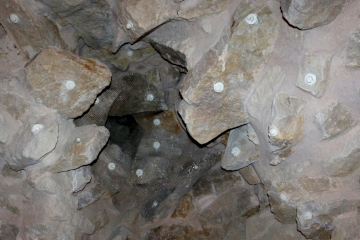 Holes were drilled in many of the ceiling stones, into which metal anchors were inserted. Treatment consisted of drilling one or more holes in each stone, usually at different angles, and then into the stones above and inserting metal anchors to fix the ceiling stones to the ones above them. For obvious reasons your home DIY hammer drill was not a good idea - the vibration would loosen the stone and bring it crashing to the floor or the hamering would split and break it apart, with much the same result. Slow-turning boring machines with expensive diamond cutters were required, which made the job even slower. In addition to the anchors, in many places the team inserted a "sock" filled with a wonder liquid that slowly set solid. Once the "sock" had been moulded into shape and crammed into the space, it ensured that there would be no more movement of the stones, effectively turning a precarious ceiling of disparate stones into a solid ceiling from one side of the tomb chamber to the other. Where appropriate a more normal grout was also applied between stones to further glue them in place. Rob Petersen, managing director of Cintec, believes that the Egyptian authorities plan to open up at least some of the tunnels beneath the Step Pyramid so that they can be visited by tourists. No date has yet been fixed nor are the terms known, though my guess is that access will be strictly controlled in terms of numbers and an extra charge will be levied. There are 3.75 miles of corridors beneath the Step Pyramid, but they are narrow and are not the place to go if you suffer from claustrophobia! Green faience tiles from the tunnels beneath the Step Pyramid, now on display in the Cairo Museum. 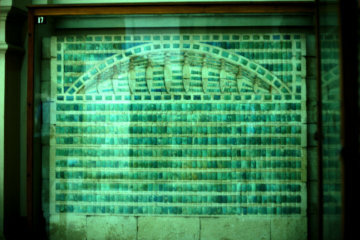 At least some of those 3.75 miles are lined with green faience tiles - a few of which have ended up in the Cairo Museum - and there are storerooms opening off them which contained 40,000 stone jars that once contained the food and drink Pharaoh Djoser required for the afterlife. Pharaohs in general - and Djoser in particular - were not noted for their abstemiousness! The Egyptian authorities are sufficiently pleased with the work on the Step Pyramid that they have invited Cintec to bid for a contract to sort out the internal passageways of the Bent Pyramid. 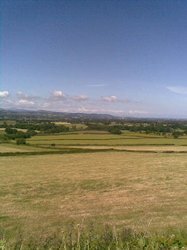 The contract will also involve securing the casing stones of that pyramid - a task with which I have considerable sympathy. A pyramid consists of blocks of stone piled up in the required shape - try it with some Lego and you'll see that the resulting pyramid has lots of "steps" in it. To finish the pyramid, the builders filled in the steps with fine white limestone, each block of which rested partly on a "step" and partly on the casing stone below. 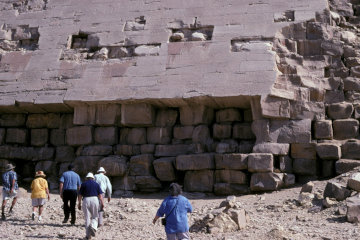 The blocks were shaped to provide a smoothly sloping surface for the pyramid and no doubt looked splendid when new. When stone robbers attacked the Bent Pyramid - and the evidence suggests that they used the same method on other pyramids - they started at the bottom, levering out the lowest blocks of stone. That meant that the upper casing stones were only held in place by the weight of the higher casing stones pressing down on the portion which was supported by the "step" beneath it, in some cases a good deal less than half the length of the casing stone. Members of one of my groups dash for the meagre shade beneath the casing stones of the Bent Pyramid! When I take tour groups to the Bent Pyramid the tour coach decants us a hundred yards or more from the base of the pyramid and the group has to plod over desert sand - never the easiest surface on which to walk - in the burning desert heat. While I give a few explanatory words about the bend in the Bent Pyramid, the group members invariably arrange themselves in the nearest bit of shade - directly beneath these unsupported casing stones! Those stones have remained in place for centuries now and there is no particular reason why they should suddenly give way just as my group is ranged beneath them, but nevertheless, it is noticeable that I remain well out of reach of them while I give my little talk!